Creamy old-fashioned vanilla fudge made with the finest all-natural vanilla and filled with Michigan cranberries and walnuts. Each slice is approx. 1/2 lb. All of our fudge is made with only the finest ingredients and worked on a marble slab the old fashioned way. 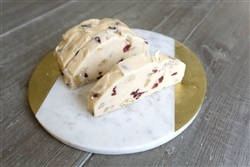 Creamy old-fashioned vanilla fudge made with the finest all-natural vanilla and filled with Michigan cranberries and walnuts.